It’s about the intersection of what is ideal and what is ‘politically achievable’. In this context, the rock represents activated social values, and what is politically achievable is like a balloon tied to that rock. The limitations of what is politically possible are directly defined by which ‘social values’ are being activated in a community, and to what extent. When intrinsic values are activated, they create space for communitarian policy responses. When extrinsic values are activated, they shut down that space. Radical opinions, as well as radical actions, expand the parameters of what options can be considered reasonable in response to an issue. Every time a coal train is blocked, the space for proposing strong government policy on renewable energy grows and regulation on pollution grows. Every time a farm gate is locked against fracking, the space for local governments to declare themselves gasfield free increases. Every time a forest activist locks on, the space for progressives to negotiate Government’s protections in the area grows dramatically. When a Liberal Party leader screams “child abuse” at an Aboriginal community, ‘moderates’ are more likely to accept the shutting off water and electricity in remote communities. When the media put the jaws of Great White Shark on the newspapers front page with headlines screaming “MONSTER” or “ATTACK”, the space for reasonable discussion about protecting Great White Sharks diminishes. When ill-informed people are left unchallenged as they scream “THEY ARE STEALING OUR JOBS”, the space for anti-immigration policies grows. The most extreme voices always define the outer parameters of a debate. So it stands then, that as long as there are radical conservative voices, then equally radical progressive ones are required to create equal space for moderate progressives to negotiate in. But it’s more than that too. The middle ground also defines itself. It defines itself by setting the boundaries of what compromises it is willing to make, and by showing how much power it can exert. It’s not just the actions at the extremes which define the limits of what is achievable, but also the strength and regularity of the actions taken by those in ‘middle’. If moderate progressives fail to organise and fail to take regular action on an issue, that space will be filled by moderate conservatives instead. But if moderate progressives get organised and take regular, strong actions, we can pull the middle ground to the left too. It’s time. 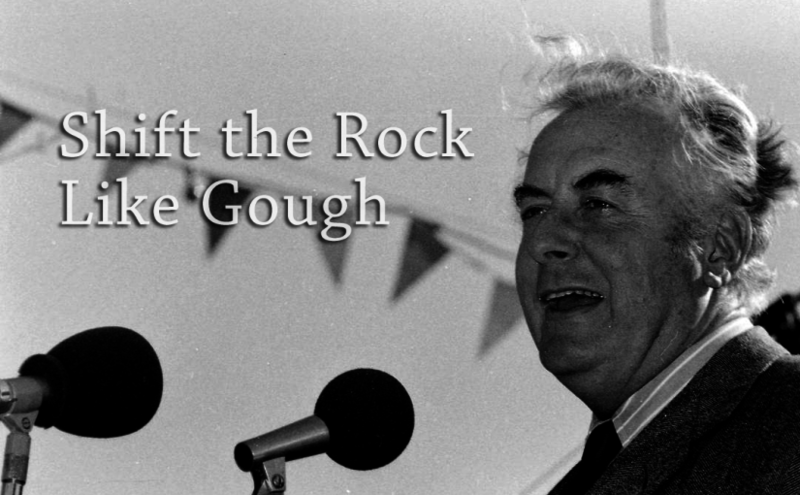 Let’s work together – moderate and radical progressives alike – to activate intrinsic social values and shift that rock, just like Gough. PS: I’ve just launched an email list to help me help my networks stay in contact, if you want to join in, you can sign up here. Hi Luke, thanks for writing this article, it’s great to get sense of what folks took away from the workshop. I really like the way you have articulated the way radicals define the outer parameters of the debate. “Politicians are like a balloon tied to a rock. If we swat at them, they may sway to the left or the right. But, tied down, they can only go so far. Instead of batting at them, we should move the rock: people’s activated social values. When we move the rock, it automatically pulls all the politicians towards us — without having to pressure each one separately.” Strategy and Soul, p184. Using this definition I’d view Gough Whitlam as a balloon tied to the rock of activated social values of Australia in the early 1970s. The active and powerful social movements of that time made Gough’s Prime Ministership possible.